Although there are many new and useful tools for making contact with possible candidates including telephone, skype interviews or even a video CV nothing quite compares to meeting a candidate/potential employer face to face. It is a tried and tested recruitment tool that has stood the test of time and is a vital part of many companies recruitment process. However, an interview can only be as useful as the preparation done by the interviewee and interviewer! Here are a few simple tips for candidates on making sure you give the best interview possible. First impressions are very important when you are meeting potential employers, so that means digging out your Sunday best! Ensure that your outfit is clean and do you have a matching pair of socks to wear? Going into an interview knowing who they are and what they offer shows them you’re interested in more than just a job that pays the bills. Know where they are and how to get there; you don’t want to ruin your chances but turning up to your interview late. Take the time to look into the job description and matching the skills and requirements of the job and match them to your own skills and attributes to ensure you have what it takes to fulfil the job role. Leading on from knowing the role, you can further develop this into practice answers which best display your skills in accordance to the job requirements. Use previous work examples to display your talent.Seems simple right? But you’d be surprised how often people get it wrong! On the other side of the coin, little focus is given to those who are conducting the interview. For many it may be the first time interviewing or you may be stuck in the habit of asking the same old questions.Here are a few simple tips to help you find the right candidate for the job. 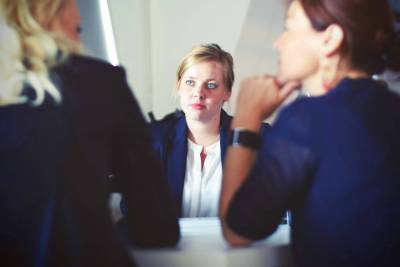 We all know that going into a job interview can be a nervous experience for many and easing candidates into the interview is a beneficial way to help them open up to you about themselves. Talk about the company and the job itself; give them some background information. Make a list of your primary questions before the interview; make a note of things you want to know. These do not need to be in-depth but it ensures that all candidates are asked the same questions and can lead into further development of interested areas. Look at the candidate's previous experience and where they worked before the interview starts. You can tailor more personal questions about the candidate when you know where they previously worked and the position they held. Again check that they appear to have the skills and experience required to fulfil the role. Ask 'open-ended questions', ones that need detail and explanation to answer rather than questions that can be answered with yes or no. You cannot get to know an individual if all they are responding are simple answers. Ask them to tell you of a job in which they performed well in their previous role. Use hypothetical questions, if you were in this position what would you do? Asking the why, or what would they would change about previous tasks completed in other roles forces the candidate to move away from planned answers and may bring about more truthful responses to their previous work. Look at the way candidates present themselves. Do they look professional? Are they sat up and looking interested or slouched and seemingly bored? The effort they put into an interview often reflects in the effort they will put into their job. Leave time at the end of the interview for the candidate to ask you questions. Not only is it beneficial for them but it also beneficial for you as this can give you the opportunity to see what the candidate is interested in. Is the job role right for them or are they only interested in the pay and holidays? Be sure to let the candidate know the timescale of when they will hear back from you. Picking the right candidate for the job takes consideration and time; keeping them in the loop will reduce their level of anxiety whilst waiting for your response and may also prevent them looking elsewhere in the interim. If you have vacancies you are are struggling to fill or you’re looking for your next opportunity give Chase Taylor a call on 01543 897800.